This document was started on Aug 26, 1999 by Mark F. Komarinski after two day's worth of frustration getting tools to work. If even one LDP author is helped by this, then I did my job. Version 4 of this document was released in early 2004 by Emma Jane Hogbin. A complete overhaul of the document was done to separate the authoring HOWTOs from the technical HOWTOs. The review took approximately eight months. The newest version of this document can be found at the LDP homepage http://www.tldp.org. The original DocBook, HTML, and other formats can be found there. There are many ways to contribute to the Linux movement that do not require the ability to produce software. One such way is to write documentation. The availability of easy-to-understand, technically accurate documentation can make a world of difference to someone who is struggling with Linux software. This Guide is designed to help you research and write a HOWTO which can be submitted to the LDP. The appendices also include sample templates, markup tips and information on how to transform your document from DocBook to another format (such as HTML) for easier proofreading. The Linux Documentation Project (LDP) was started to provide new users a way of quickly getting information about a particular subject. It not only contains a series of books on administration, networking, and programming, but also has a large number of smaller works on individual subjects, written by those who have used it. If you want to find out about printing, you get the Printing HOWTO. If you want to do find out if your Ethernet card works with Linux, grab the Ethernet HOWTO, and so on. The LDP provides documents to the world in a variety of convenient formats and also accepts submissions in a number of formats. The current standard for storing the source documentation is a format known as DocBook, see Section 5.2. The Linux Documentation Project (LDP) is working on developing free, high-quality documentation for the GNU/Linux operating system. The overall goal of the LDP is to collaborate in all of the issues of Linux documentation. This includes the creation of "HOWTOs" and "Guides". We hope to establish a system of documentation for Linux that will be easy to use and search. This includes the integration of the manual pages, info docs, HOWTOs, and other documents. The human readable version goes more like this: The LDP consists of a large group of volunteers who are working on documentation about Linux and the programs which run on the Linux kernel. These documents exist primarily as shorter HOWTOs and longer Guides. Both are available from http://www.tldp.org/. This Guide focuses primarily on how to write your own HOWTOs for submission to the LDP. Send feedback to <[email protected]>. Please reference the title of this document in your email. Please note: you must be subscribed in order to send email to the list. Permission is granted to copy, distribute and/or modify this document under the terms of the GNU Free Documentation License, Version 1.1 or any later version published by the Free Software Foundation; with no Invariant Sections, with no Front-Cover Texts, and with no Back-Cover Texts. A copy of the license is included in the appendix entitled "GNU Free Documentation License." Thanks to everyone that gave comments as I was writing this. This includes David Lawyer, Deb Richardson, Daniel Barlow, Greg Ferguson, Mark Craig and other members of the <[email protected]> list. Some sections I got from the HOWTO Index and the sgmltools documentation. The sections on network access to CVS was partially written by Sergiusz Pawlowicz (<[email protected]>). Sections on DocBook were written by Jorge Godoy (<[email protected]>). A great deal of thanks to both of them for their help. Submit your document for technical, language and metadata reviews. Do this by emailing your document to <[email protected]>. In the subject line be sure give the title of the document. In the body of the email say that you are ready for the review process. Outline any additional reviews your document may have already received. You should be assigned a reviewer within the week. The reviews may take an additional week each. For more information about this process, please read Chapter 6. It is likely that if you are reading the Author Guide, you already have a subject in mind. The idea may have come from your own frustrations in trying to get something to work; or maybe you are already writing or have written documentation for other purposes and you want to submit it to the LDP. For example, if you posted a question to a mailing list and it took many posts to resolve the problem -- that might be an incentive to write documentation. Regardless of how you picked your subject, it is important that the LDP community understand why your documentation should be included in its collection. If someone has requested documentation, or you worked with a mailing list to resolve a problem you should include the details in your proposal to the LDP discuss mailing list. It may help others to understand the need for your specific document. Clearly defined. Define the boundaries of your subject area before you begin. Do not repeat information that is in another HOWTO and do not leave gaps of information between your HOWTO and someone else's HOWTO. Not too broad, and not too narrow. If you try to cover too much information you may sacrifice depth. It is better to cover a small subject area in detail than to cover a large subject area poorly. Linux tools are known for doing exactly one thing and doing that one thing well. Similarly, your HOWTO should cover one subject and cover it well. If the scope of your proposed document is very narrow, it might be better to include your information as part of another HOWTO. This makes it easier for readers to find the HOWTO they need. Search the LDP repository for topics which relate to your document. If you find a document which is a good match, email the author and ask them if they would like to include your contribution. Undocumented. Before documenting a particular subject, always do a web search (and specifically a search within the LDP documents) to see if your topic is already covered in another document. If it is, refer to the other document instead of duplicating the information within your own document. You may wish to include a brief summary of information that can be found in other documents. If the HOWTO already in place is insufficient or needs updating, contact the author and offer to help. See also Section 3.3 for taking over old or unmaintained documents. Most authors appreciate any help offered. Additionally, sending comments and remarks to the author is usually regarded both as a reassurance and a reward: to the author, feedback is the ultimate proof that writing the documentation was not a pointless effort. Pre-approved by the LDP. Before you proceed with your HOWTO, post to the discuss list and get some feedback from other LDP volunteers. Checking with the list before you begin can save you headaches later. Joining the discuss list and following it regularly, even if you never post, is a good way to stay current on the activities, needs and policies of the LDP. Guides. A guide covers a broad subject and is quite long. The Author Guide (this document) is a guide. Other guides include: Introduction to Linux: A hands on guide, The Linux Kernel Module Programming Guide, etc. A full list of guides is available from: Linux Project Documentation Guides. Guides use the "book" templates located in Appendix A.
HOWTOs. A HOWTO is typically a set of instructions that outlines, step-by-step, how a specific task is accomplished. Examples of HOWTOs are: CDROM-HOWTO Module-HOWTO. A full list of HOWTOs is available from: Single List of HOWTOs (warning: it's a BIG page). HOWTOs typically use the "article" template and are output to multiple HTML pages by default. Templates are available in Appendix A.
man pages. man (Manual) pages are the standard form of help available for many linux applications and utilities. They can be viewed by typing man applicationname at a prompt. A full list of man pages is available from: Linux Man Pages. Since man pages are bundled with software there is no LDP template at this time. FAQs. FAQs (Frequently Asked Questions) are a list of questions and answers to help prevent new users from asking the same questions over and over again. A full list of FAQs is available from: Linux Documentation Project FAQs. FAQs typically use the "article" template with some specific DocBook elements to form the Question/Answer structure. You can find a template for writing a FAQ in Appendix A. The LDP no longer distinguishes between HOWTOs and mini-HOWTOs. All previously written mini-HOWTOs have been included in longer HOWTOs. All new documents must be at least HOWTO in length. This means the documents should cover a bigger subject area rather than a small one. If your document is very small you may wish to submit it for inclusion in another, larger HOWTO that already exists. If you're not sure what size your document is, email the discuss list and ask for feedback. If you wish to become the "owner" for an unmaintained document there are several steps you must go through. Contact the author. Make sure the author no longer wishes to maintain the document in question. Note that the E-mail address shown may no longer be valid. In that case, try a search for the author. If the original author of a document cannot be found after a "good-faith" effort, let us know (<[email protected]>--subscription required). Inform the LDP which document you would like to maintain, so that we can track who is working on what and prevent duplication of effort. We also suggest that you join the LDP general discussion list (<[email protected]>). This step is also required for new documents. Submit the document to the LDP with any intended modifications. Make sure to continue to reference the original author somewhere within the document (Credits, Revision History, etc.). Once the document is re-submitted, we will remove the entry from the list of unmaintained documents. Some of unmaintained documents may be outdated, or the content may be covered in another (actively maintained) HOWTO. If that is the situation, contact us (preferably on the discuss mailing list) and let us know. Before you actually begin writing, prepare an outline. An outline will help you to get a clear picture of the subject matter and allow you to concentrate on one small part of the HOWTO at a time. Unless your HOWTO is exceptionally small, your outline will probably be multilevel. When developing a multilevel outline, the top level should contain general subject areas, and sub-headings should be more detailed and specific. Look at each level of your outline independently, and make sure it covers all key areas of the subject matter. Sub-headings should cover all key areas of the heading under which they fall. Each item in your outline should follow the item before it, and lead into the item that comes next. For example, a HOWTO about a particular program shouldn't have a section on configuration before one on installation. You may find it helpful to try a little "card sorting" at this stage of the writing process. Write all of your mini subject areas onto pieces of paper. Now sort these pieces of paper into main headings and their sub-sections. It may help to shuffle the slips of paper before you start. This will help to give you a fresh set of eyes while working. When you are comfortable with your outline, look it over once more, with a critical eye. Have you covered every relevant topic in sufficient detail? Have you not wandered beyond the scope of the document? It is a good idea to show your outline to others (including The LDP discuss list) to get some feedback. Remember: it is much easier to reorganize your document at the outline stage than doing this after writing it. For help writing your HOWTO outline, and getting a head start on the markup of your document, check out The LDP HOWTO Generator. Note that this is for generating HOWTOs. Templates for FAQs and Guides are available in Appendix A. You might have noticed a theme developing here. Just like Free software, Free documentation is best when you "release early, release often." The discuss list includes many experienced LDP authors, and you would be wise to seek their advice when making decisions about your contribution. Compile your resources as you research. It is almost guaranteed you will not remember where to find a critical piece of information when you need it most. It will help to bookmark important (and even not so important) pages as you go. Make sure the bookmark's title reflects why the page is important to you. If there are multiple key ideas in one page, you may want to bookmark the same page with different titles. Assume your most important resource will disappear. The dreaded "Error 404: Page not found". Even if you have bookmarked a page it may not be there when you return to it. If a page contains a really critical piece of information: make a copy. You may do this by creating a text file with the title of the document, the author's name, the page's URL and the text of the page into a text file on your computer. You might also choose to "print" the file to a PDF (save as or convert to PDF format will capture the original URL on the page if you're using a smart browser). Start your "Resources" page now. As you find pages of interest add them to a Resources document. You may do this by exporting your bookmarks or by keeping a separate text file with the Resources sorted by sub-category. A little effort now will save you a lot of time later. There is more information about the DocBook markup of bibliographies in Section D.7. Write down subject areas as you go. If you are card sorting you may find it particularly useful to write topic cards as you find pages that cover that specific topic. At the top of the card write the subject area. In the main area of the card write a few notes about what you might cover under this topic--include the titles of pages that contain important information. If a sub-topic gets too big you may want to divide it into multiple cards. Separate generic information from version-specific information. A new version of the software that you describe might be released the day after you release your document. Other things, like where to download the software, won't change. Alternatively, you may choose to document old problems with specific software as a way of encouraging readers to upgrade to the latest version available: "Version X of the software is known for a specific bug. The bug was fixed as of Version Y." Save all related emails. People will often have interesting insight into the problem that you are writing about. Any questions that are asked about your topic should be addressed in the final document. If you are writing about software make sure to ask people what system they are using. Add information in your document about which system configurations your instructions have been tested on. (Having lots of friends with moderately different configurations can be very beneficial!) All of these personal experiences can add greatly to your final documentation. Once you've written the text of your HOWTO, it is time to polish and refine it. Good editing can make the difference between a good HOWTO and a great one. One of the goals of editing is to remove [extraneous] material that has crept its way into your document. You should go through your HOWTO carefully, and ruthlessly delete anything that does not contribute to the reader's understanding of the subject matter. It is natural for writers to go off on tangents while in the process of writing. Now is the time to correct that. It often helps to leave a bit of time between when you write a document and when you edit it. Make sure that the content of every section matches the title precisely. It's possible that your original subject heading is no longer relevant. If you've strayed from your original heading it could mean one of the following: the original title was poorly worded, the new material should actually go in a different section, or the new material is not really necessary for your document. If you need to change a title, check to see if the original subject heading is still important. If it is, make sure that topic is covered somewhere else in the document. When editing and proofing your work, check for obvious mistakes, such as spelling errors and typos. You should also check for deeper, but less obvious errors as well, such as "holes" in the information. If you are creating a set of instructions it may help to test them on a new machine. Sometimes there are packages that need to be installed which you've forgotten to mention in your documentation, for instance. When you are completely satisfied with the quality and accuracy of your work, forward it to someone else for third-party proofing. You will be too close to the work to see fundamental flaws. Have others test the instructions as well. Make sure they follow exactly what you have written. Ask anyone who tests your documentation to make specific notes in any places where they didn't follow your instructions (and the reason why they didn't follow them). For example: "I skipped step 2 because I already have the required packages installed." In a sense, editing is like code review in software development. Having a programmer review their own code doesn't make much sense, and neither does having a writer edit their own document. Recruit a friend, or write the discuss list to find a volunteer to proofread before submitting your document. You may also want to submit your document to a mailing list that is relevant to your document's topic. List members should be able to help check the facts, clarity of your instructions and language of the document. If you are writing in a language in which you are not fluent, find an editor who is. Technical documentation, more than any other type of writing, must use extremely precise grammar and vocabulary. Misuse of language makes your document less valuable. You do not need to submit your initial document to the LDP in anything more than plain text! Other open submission formats are accepted as well, for instance OpenOffice documents, RTF files or HTML. The LDP volunteers will convert your document to DocBook for you. Once it has been converted you will need to maintain your document in DocBook format, but that should be obvious. You may use any word processing or text editing tool to write your initial document. When you get to the markup stage you may want to use a text editor which recognizes DocBook files. At a minimum a program which adds syntax highlighting to your markup will make life a lot easier. For a description of editors which can handle DocBook files please skip to Section B.2. For more information on how to use CVS to maintain your LDP documents, please read Appendix C.
Some writing tools will come with their own built-in spell check tools. This list is only if your application does not have a spell check option. This spell check application can work around XML tags. By distinguishing between content and markup aspell is able to check your content and ignore the bits it shouldn't be looking at. If you are getting spelling errors in your markup tags you may be using an old version and should upgrade. An interactive user interface allows for fast and easy correction of errors. Use the --help to read more about aspell features. Similar to aspell, but tries to spell check your markup tags. If you have a choice, use aspell, if not, ispell is a very acceptable substitute. A markup language is a system for marking or tagging a document to define the structure of the document. You may add tags to your document to define which parts of your document are paragraphs, titles, sections, glossary items (the list goes on!). There are many markup languages in use today. XHTML and HTML will be familiar to those who author web documents. The LDP uses a markup language known as DocBook. Each of these markup languages uses its own "controlled vocabulary" to describe documents. For example: in XHTML a paragraph would be marked up with the tagset <p></p> while in DocBook a paragraph would be marked up with <para></para>. The tagsets are defined in a quasi dictionary known as a Document Type Definition (DTD). Markup languages also follow a set of rules on how a document can be assembled. The rules are either SGML (Standard Generalized Markup Language) or XML (eXtensible Markup Language). These rules are essentially the "grammar" of a document's markup. SGML and XML are very similiar. XML is a sub-set of SGML, but XML requires more precise use of the tags when marking up a document. The LDP accepts both SGML and XML documents, but prefers XML. There are three components to an XML/SGML document which is read by a person. Content. As a TLDP author it is good to remember that this is the most important piece. Many authors will write the content first and add their markup later. Content may include both plain text and graphics. This is the only part that is required of LDP authors! Markup. To describe the structure of a document a controlled vocabulary is added on top of the content. It is used to distinguish different kinds of content: paragraphs, lists, tables, warnings (and so on). The markup must also conform to either SGML or XML rules. If you are not comfortable adding markup to your document, a TLDP volunteer will do it for you. Transformation. Finally the document is transformed from DocBook to PDF, HTML, PostScript for display in digital or paper form. This transformation is controlled through the Document Style Semantics and Specification Language (DSSSL). The DSSSL tells the program doing the transformation how to convert the raw markup into something that a human can read. The LDP uses a series of scripts to automate these transformations. You are not required to transform your own documents. Steve Champeon does a great job of explaining how content, markup languages, and transformations all fit together in his article The Secret Life of Markup. Although he is writing from an HTML perspective, the ideas are relevant and there is an example of DocBook markup. DocBook is a general purpose XML and SGML document type particularly well suited to books and papers about computer hardware and software (though it is by no means limited to these applications). In the next sections we will be explaining about the theoretical side of DocBook, its origins, development, advantages and disadvantages. If you just want the practical side, check out these sections for an overview of HOWTO DocBook: , Appendix D, and Appendix E from this guide. We wish to stress again the fact that any open document format will be accepted. If you feel more comfortable with plain text, OpenOffice or HTML, that is fine with us. If you do not look forward to learning DocBook, LDP volunteerd will convert your document to DocBook XML. To us, the most important task for our authors is the actual writing, not the formatting, keep that in mind! From the point of submission onwards, however, you will have to maintain your document in this XML format, but that's a piece of cake. Promised. Although there are other DTDs used to write documentation, there are a few reasons not to use them. DocBook is the most popular DTD, being used by more than a dozen major open source projects from GNOME to Python to FreeBSD. The tools for DocBook are more developed than others. DocBook support is included in most Linux distributions, allowing you to send raw files to be processed at the receiver's end. And finally, DocBook has an extensive set of tags (over 300 in all) which is very useful when you are trying to describe the content of a document. Fortunately for new authors the majority of them do not need to be used for simple documentation. Still not convinced? Eric Raymond has written a DocBook Demystification HOWTO which may help. Convinced, but still not comfortable with the thought of working with DocBook? Give David Lawyer's Howtos-with-LinuxDoc-mini-HOWTO a try. DocBook comes in a couple of different flavors--including both XML and SGML formats. This means that you may use either the SGML grammar/rules when adding markup, or you may use the XML grammar/rules. Either way you may only use one set of rules throughout your document, and you must define which one you are using at the top of your document. Libraries for handling XML files are developing at a rapid pace. These utilities may make it easier for new authoring tools to become available. Many popular word processing programs are now creating XML output. While it may not be DocBook XML, this does make it easier for application writers to either add DocBook XML support, or provide some method of translating between their format and DocBook XML. Everyone else is doing it. While this might not be a real reason, it allows the LDP to keep up-to-date with similar projects. Tools, procedures, and issues can be worked out in a common framework. Before you distribute your documentation, there are a few more things that you will need to check and possibly add to your document. You can read more about helper applications in Section 4.3.3. You should also check your document for its overall flow and clarity. Give credit where credit is due. For more information about when to give credit, read Section 6.3. The LDP distributes documents, however, the author maintains the copyright on the document. All documents accepted by the LDP must contain a license and copyright notice. You can read more about this in Section 6.2.1. You may also want to add a Disclaimer, but this is optional. More about this in Section 6.2.2. If you are submitting a DocBook or LinuxDoc document, make sure the markup is valid. Read why in Section B.3.1. You may want to have others review your document before submitting it to the LDP. Ask people for a Peer Review and/or a Technical Accuracy Review. Since not all mailing lists will respond favorably to attachments, you may wish to set up a temporary web site which houses your document. Note: this is absolutely not required. In order for a document to be accepted by the LDP, it must be licensed and conform to the "LICENSE REQUIREMENTS" section of the LDP Manifesto located at http://www.tldp.org/manifesto.html. We recommend using the GNU Free Documentation License (GFDL), one of the Creative Commons Licenses (Share-Alike, or Attribution-Share-Alike), or the LDP license (currently under review). The full text of the license must be included in your document, including the title and version of the license you are using. The LDP will not accept new documents that do not meet licensing requirements. The Debian package maintainer for LDP documents has divided the LDP documents into those with a "free" license and those with a "non-free" license. For a summary of this list, please read Debian License Summaries. Currently the Artistic License, BSD License and the GNU General Public License are listed as "free". These licenses will also be accepted by the LDP. The definition of "non-free" has not been made transparent. By choosing another license that has any kind of restriction on redistribution or whether or not the document may be modified, your document may be put into the "non-free" package instead of the "free" package. We are working with Debian to clarify how these decisions are made. You can get DocBook markups of both the GNU GPL and the GNU FDL from the GNOME Documentation Project. You can then merely include the license in its entirety in your document. A DocBook-formatted copy of the license is available in Appendix A. For more information about open source documentation and licensing, please check . As an author, you may retain the copyright and add other restrictions (for example: require approval for any translations or derivative works). If you are a new maintainer of an already-existing HOWTO, you must include the previous copyright statements of the previous author(s) and the dates they maintained that document. No liability for the contents of this document can be accepted. Use the concepts, examples and information at your own risk. There may be errors and inaccuracies, that could be damaging to your system. Proceed with caution, and although it is highly unlikely that accidents will happen because of following advice or procedures described in this document, the author(s) do not take any responsibility for any damage claimed to be caused by doing so. If your HOWTO includes bits of source code that you want others to use, you may choose to release the source code under GPL. Your document should have an "Acknowledgments" section, in which you mention everyone who has contributed to your document in any meaningful way. You should include translators and converters, as well as people who have sent you lots of good feedback, perhaps the person who taught you the knowledge you are now passing on, and anybody else who was instrumental in making the document what it is. Most authors put this section at the end of their document. When someone else assists in the production of an LDP document, you should give them proper attribution, and there are DocBook tags designed to do this. This section will show you the tags you should use, as well as other ways of giving credit where credit is due. Crediting editors is easy - there is already an <editor>tag in DocBook. But there are two special cases where you need to credit someone, but DocBook doesn't provide a special tag. These are translators and converters. A converter is someone who performs a source code conversion, for instance from HTML to DocBook XML. Source code conversions help the LDP achieve long term goals for meta-data, and allow us to distribute documentation in many different formats. Translators take your original document and translate it into other human-readable languages, from English to Japanese for example, or from German to English. Each translation allows many more people all over the world to make use of your document and of the Linux operating system! We recommend that you acknowledge converters in the comment for the initial version released in the new format, and we recommend that you credit translators in each version which they have translated. When you feel your document is finished, email a copy to the submit mailing list (<[email protected]>). Please include the title of your document and "Final Review Required" in the subject line of your email. A team of volunteers will be assigned to your document for each of the reviews. It may take up to a week to gather a team who is qualified to review your document. Typically the technical review happens first, followed by the language review and finally the metadata review. Your reviewers will read your document give you feedback on whether or not they think your document is ready for publication in the LDP collection. This section contains information on what to do after your document has received both a technical and language review by the LDP volunteers. As part of the review process a Review Coordinator will add your document to the CVS (including any associated image files) and notify the submit mailing list that your document is ready for publication. Just because your document has now been published does not mean your job is done. Linux documentation needs regular maintenance to make sure it is up to date, and to improve it in response to readers' ideas and suggestions. TLDP is a living, growing body of knowledge, not just a publish-and-forget-it static entity. Add relevant mailing lists to your document where people can get support. If you have the time, follow these mailing lists yourself to stay up-to-date on the latest information. Put your email address in the document, and politely request feedback from your readers. Once you are officially published, you will begin to receive notes with suggestions. Some of these emails will be very valuable. Create a folder in your mail program for incoming suggestions--when the time is right review the folder and make updates to your document. If you are following a related mailing list you may also choose to save a copy of important emails from the list to this folder. Some people who email you will request personal assistance. You should feel free to decline personal assistance if you cannot spare the time. Writing a contribution to the LDP does not commit you to a lifetime of free support for anyone on the net; however, do try to reply to all requests and suggest a mailing list that will (hopefully) be able to provide support to your reader. If you find an error in your own document, please fix it and re-submit the document. You can re-submit your files by emailing them to <[email protected]>. If you have been using the CVS, you can submit your changes to the CVS tree and then send a note to the submit mailing list (<[email protected]>). In your email please give the exact path of your document in the CVS tree. Remember to update the revision history at the top of the document. If you find an error in someone else's document please contact the author of the document with the correction. If you do not hear back from the author within a "reasonable" amount of time, please email the LDP coordinator at <[email protected]> (subscription required) and describe the problem and how you think it needs to be fixed. If the license permits, you may be asked to make the change directly to the document. If the problems are serious, the document may be removed from the collection, or moved to the "Unmaintained" section. For more information on how to deal with unmaintained documents, please read: Unmaintained (includes a list of steps to take to take over "ownership" of unmaintained documents, and a list of unmaintained documents). HOWTO (Article) templates/ldp-howto.zip. Most HOWTO documents will use this template. Guide (Book) templates/ldp-guide.zip. Use this template to create a full book (like this Author Guide, for instance). Templates provided by Tille Garrels. FAQ templates/ldp-faq.zip. A standard article for writing a FAQ (Frequently Asked Questions) list. LinuxDoctemplates/ldp-linuxdoc.zip. A standard template both in HOWTO length and Guide length. Disclaimer disclaimer.xml. A standard disclaimer which warns readers that (1) your document may not be perfect and (2) you are not responsible if things end up broken because of it. The following style sheets can be used to make your document nicer to look at. Remember that the LDP will use its own style sheets to distribute your documentation. DSL Style Sheet style.dsl. This DSL style sheet was provided by Tille and is to be used with DSSSL transformations. Cascading Style Sheet style-ob.css. This CSS file was provided by Saqib Ali and Emma Jane Hogbin. The "ob" is for "orange and blue". Use this CSS file with an HTML file. Instructions are included in the CSS file. The GFDL (GNU Free Documentation License) is available in XML format at http://www.gnu.org/licenses/fdl.xml. For a version in appendix format suitable for including in your document, you can see get the XML for this document from CVS at http://cvsview.tldp.org/index.cgi/LDP/guide/docbook/LDP-Author-Guide/fdl-appendix.xml. TLDP template files for DocBook (XML and SGML) and Linuxdoc SGML are available from the TLDP website at http://www.tldp.org/authors/index.html#resources. In this section, we will cover some of the tools that you may want to use to create your own LDP documentation. If you use some other tool to assist you in writing documents for the LDP, please drop us a line and we'll add a blurb for it here. Section 1.3 has contact information. A few notes on setting up your system for DocBook publishing. These tools focus more on the transformation of documents from DocBook to XHTML (for example). Notes contributed by Charles Curley. Tools for Docbook SGML and XML are included in the distrubution. So are Emacs and PSGML mode, although you will have to customize your .emacs. If you are missing a package after installing Fedora, get familiar with yum or apt. Installation instructions: none; use Red Hat 9 until they are written: http://www.redhat.com/docs/manuals/linux/RHL-9-Manual/. In Mandrake (as of my current 9.2), all the stuff including openjade, xmlto, docbook-utils etc. comes as standard. So I just needed to get the TLDP XSL sheet and that's all. Didn't ever have any dependency or other problems, everything works fine (knock on wood :-)). According to Hal Burgiss, your system is likely already ready to edit and process DocBook documents without installing any additional packages. Editing tools have come a long way in their support for XML (and specifically DocBook). There are two types of editors outlined in this section: text editors (emacs, vim, etc); and word processors (OpenOffice, AbiWord, etc). New authors who are not comfortable working with markup languages should probably choose a word processor that can output DocBook files. For this reason the word processors are listed first. Although many editors can also validate your DocBook files, this information has been separated into Section B.3. Check the resources section for more . 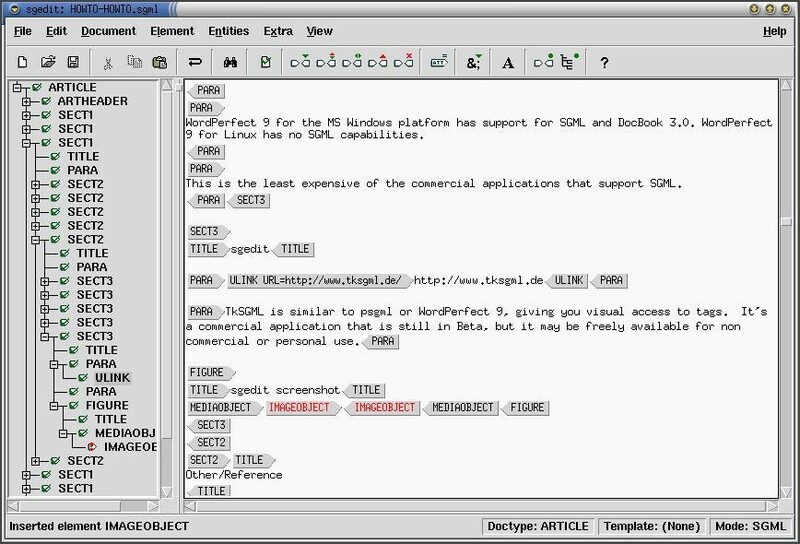 Even if you are not comfortable working DocBook's tagset in a text editor you can still produce valid DocBook documents using a word processor. Support at this point is very limited, but it does exist in the following programs. The up side, of course, is that things like spell check are built in to the program. In addition to this, support for DocBook (and XML) is constantly improving. Even if you want to use MS Word to write your documents, you may find w2XML useful. Note that this is not free software--the cost is around $130USD. There is, however, a trial version of the software. Remember that all formatting changes you make to your document will be ignored when your document is released by the LDP. Instead of focusing on how your document looks, focus on the content. Through word of mouth I've heard that AbiWord can work (natively) with DocBook documents. This will need to be tested by someone (possibly me) and should definitely be included if it is the case. Although OOo uses the full DocBook document type declaration, it does not actually export the full list of DocBook elements. It uses a "simplified" DocBook tagset which is geared to on-the-fly rendering. (Although it is not the official Simplified DocBook which is described in Section B.5.) The OpenOffice simplified (or "special" docbook) is available from http://xml.openoffice.org/xmerge/docbook/supported_tag_table.html. WordPerfect 9 for the MS Windows platform has support for SGML and DocBook 3.0. WordPerfect 9 for Linux has no SGML capabilities. Although strictly speaking, it is not a word processor, XMLmind's XML editor allows authors to concentrate on the content, and not the markup. It has built in spelling and conversion utilities which allow you to transform your documents without having to install and configure an additional processing tool such as jade. There is a free "standard edition", which is a simplified version of their "professional edition." According to their web site, "Conglomerate aims to be an XML editor that everyone can use. In particular, our primary goal is to create the ultimate editor for DocBook and similar formats. It aims to hide the jargon and complexity of XML and present the information in your documents in a way that makes sense." According to their web site, "The visual part comes from the fact that Vex hides the raw XML tags from the user, providing instead a wordprocessor-like interface. Because of this, Vex is best suited for document-style XML documents such as XHTML and DocBook rather than data-style XML documents." The tools outlined in this section allow you to work with the DocBook tags directly. If you are not comfortable working with markup languages you may want to use a word processor instead. Word processors that support DocBook are described in Section B.2.1. If you are comfortable working with markup languages and text editors, you'll probably want to customize your current editor of choice to handle DocBook files. Below are some of the more common text editors that can, with some tweaking, handle DocBook files. For users of Emacs, it's a great way to go. PSGML works with DocBook, LinuxDoc and other DTDs equally well. If you have installed a recent distribution, you may already have PSGML installed for use with Emacs. To check, start Emacs and look for the PSGML documentation (C-himpsgml). If you don't have PSGML installed now might be a good time to upgrade Emacs. The rest of these instructions will assume you have PSGML installed. If you want GNU Emacs to enter PSGML mode when you open an .xml file, it will need to be able to find the DocBook DTD files. If your distribution already had PSGML set up for use with GNU Emacs, you probably won't need to do anything. For more information on how to configure Emacs, check out . Once you've configured your system to use PSGML you will need to override Emacs' default sgml-mode with the psgml-mode. This can be done by configuring your .emacs file. After you've edited the configuration file you will need to restart Emacs. There are a number of steps to creating a new DocBook XML file in Emacs. Create a new file with an xml extension. Enter C-c C-p. If Emacs manages to parse your DTD, you will see Parsing prolog...done in the minibuffer. If things are working correctly, you should see new tags for the parent element for your document right after the document type declaration. In other words you should now see two extra tags: <article> and </article> in your document. Emacs can be configured to use aspell by adding the following to your ~/.emacs file. Thanks to Rob Weir for this configuration information. Along with visual editing, epcEdit will also validate documents on loading, and on demand by using the Document->Validate command. This is a commercial application which is currently available for free (with an optional user registration). It is written in Java, allowing it to run on any platform that has a Java Virtual Machine (that is, works in both Windows and Linux). On the plus sides of XMLEditor is the left side of the screen shows the hierarchy of the document (starting with Book and so on). Selecting an item in the list brings you to that part of the document so you can edit it. The right part of the screen shows the text without any markup or tags being shown. If you have external files as ELEMENTS (as the LDP Author Guide does), XMLEditor will follow the links and load the files, so you always work on the entire work. On the minus side of this, you will get errors if a file is missing. To be fair, nedit is more for programmers, so it might seem a bit of overkill for new users and especially non-programmers. All that aside, it's extremely powerful, allowing for syntax highlighting. Unlike epcEdit, nedit doesn't allow you to automatically insert tags or automatically validate your code. However, it does allow for shell commands to be run against the contents of the window (as opposed to saving the file, then checking). If you have line numbers turned on (using Preferences->Show Line Numbers) then finding validation errors is much simpler. nsgmls, the validation tool we'll use, lists errors by their line number. Since you can feed the contents of your window to outside programs, you can easily extend nedit to perform repetitive functions. The example you'll see here is to validate your document using nsgmls. For more information about nsgmls and validating documents please read Section B.3. Select Preferences->Default Settings->Customize Menus->Shell Menu.... 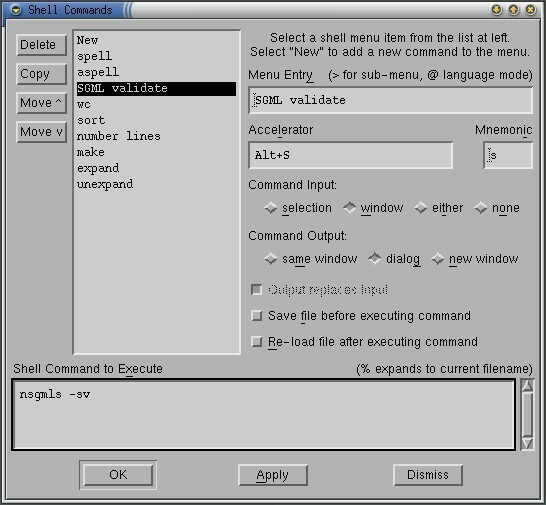 This will bring up the Shell Command dialog box, with all the shell commands nedit has listed under the Shell menu. Under Menu Entry, enter "Validate DocBook." This will be the entry you'll see on the screen. Under Accelerator, press Alt-S. Once this menu item is set up, you can press Alt-S to have the Validate DocBook automatically run. Under Command Input, select window, and under Command Output, select dialog. Under Command to Execute, enter nsgmls -sv. Using -v outputs the version number is output to the screen so that you know the command has run. Note that nsgmls has to be in your PATH for this to work properly. Click OK and you'll now be back at the main nedit screen. Load up an XML file, and select Shell->Validate DocBook or press Alt-S. The nedit program will fire up and check the contents of the window. If all you see is a version number for nsgml then your document is valid. Any errors are reported by line number in your document. No mention of text editors is complete without talking about vi. The VIM (Vi IMproved) editor has the functionality of regular vi and includes "syntax highlighting" of tags. There are many versions of vi. New authors will likely want one of the more feature-packed versions for syntax highlighting and a graphical interface including mouse control. Red Hat users will want the following packages: vim-common, vim-minimal and vim-enhanced. Debian users will want the following package: vim. For an X interface (including GUI menus and mouse control) users will want gvim. The "g" in gvim is for "Graphical". VIM compiles very easy should you need to build your own. Both vim and gvim are built by default. Syntax highlighting is included but not enabled by default if you have to start from scratch; use the :syntax enable command in VIM to turn this feature on. In both vim and gvim, .xml files will be recognized and enter into "SGML mode". A series of known DocBook tags and attributes have been entered into vim and will be highlighted one color if the name is known and another if it is not (for this author the colors are yellow and blue). As in Emacs, Vim, will work quite happily with aspell. It can be run from within Vim with the following: :! aspell -c %. For more sophisticated spell check alternatives, give Cream or vimspell a try. The following information is provided by Kwan Lowe. Vim has a DocBook helper script which can be easily copied into your .vimscripts directory and used to "auto complete" tags while writing DocBook documents. The script can be downloaded from: http://www.vim.org/scripts/script.php?script_id=38. Grab the file, then untar it. Copy the dbhelper.vim to your .vimscripts directory if you have one. This web-based application allows you to put in the URL for XML source, or copy and paste the XML directly into the web form. The application then breaks down your document into a series of form fields that hide the DocBook tags so that you may edit the content directly. Version 5 is available from http://www.datamech.com/XMLForm/formGenerator5.html. This application is best on shorter documents (less than 20 pages printed). As this is an on-line tool, it will be good for small updates only. I am a big fan of XMLMind's XXE editor and XFC FO converter. It is "free as in beer," but not necessarily "free as in speech." Very liberal license for personal use however. It's Java-based so it works on all sorts of OS's. This section is about how to transform documents from DocBook to other formats. If you do not need to transform documents for your own web site, or to proof read the content, please	skip this section. If you would like to transform your documents for proofreading purposes, please use the XML to HTML on-line converter. You will need to upload your XML file(s) to a web site. Then simply drop the URL into the form and click the submit button. Your document will be magically transformed into a beautiful (and legible) HTML document. External files are supported. You may use either absolute or relative URIs. You do not ever need to transform documents before submitting to the LDP. The LDP volunteers have a system which transforms your DocBook file into HTML, PDF and plain text formats. There, you've been warned. Still here? Great! Transformations are a pretty basic requirement to get what you've written from a messy tag-soup into something that can be read. This section will help you get your system set up and ready to transform your latest document into other formats. This is very useful is you want to see your document before you release it to the world. There are currently two ways to transform your document: Document Style Semantics and Specification Language (DSSSL); and XML Style sheets (XSLT). Although the LDP web site uses DSSSL to convert documents you may use XSLT if you want. You only need to choose one of these methods. For more information about DSSSL read: Section B.4.1, for more information about XSLT read: Section B.4.3. There are two versions of the Document Style Semantics and Specification Language used by the LDP to transform documents from your raw DocBook files into other formats (which are then published on the Web). The LDP version of the style sheets requires the Norman Walsh version--which basically means if you're using DSSSL the Norman Walsh version can be considered a requirement for system setup. Norman Walsh DSSSL http://docbook.sourceforge.net/projects/dsssl/. The Document Style Semantics and Specification Language tells Jade (see Section B.4.1.2) how to render a DocBook document into print or on-line form. The DSSSL is what converts a title tag into an <h1> HTML tag, or to 14 point bold Times Roman for RTF, for example. Documentation for DSSSL is located at the same site. Note that modifying the DSSSL doesn't modify DocBook itself. It merely changes the way the rendered text looks. The LDP uses a modified DSSSL (see below). LDP DSSSL http://www.tldp.org/authors/tools/ldp.dsl. The LDP DSSSL requires the Norman Walsh version (see above) but is a slightly modified DSSSL to provide things like a table of contents. Create a base directory to store everything such as /usr/share/sgml/. Copy the DSSSL style sheets into a sub-directory named dsssl. There are two versions of the Jade processor: the original version by James Clark; and an open-source version of approximately the same program, OpenJade. You only need one of these programs. It should be installed after the DTD and DSSSL have been "installed." Currently, the latest version of the package is jade-1.2.1.tar.gz. Jade is the front-end processor for SGML and XML. It uses the DSSSL and DocBook DTD to perform the verification and rendering from SGML and XML into the target format. An extension of Jade written by the DSSSL community. Some applications require jade, but are being updated to support either software package. Tell your system where to find the SGML_CATALOG_FILES (yes, even if you are using XML). You can find an example of how to do this in Example B-1. Download the DSSSL and DTD files and copy them into your working directory. You can find an example of how to do this in Example B-5 and Example B-7. Once your system is configured (see the previous section), you should be able to start using jade to transform your files from XML to XHTML. To create individual HTML files, point jade at the correct DSL (style sheet). The following example uses the LDP style sheet. If you would like to produce a single-file HTML page, add the -V nochunks parameter. You can specify the name of the final HTML file by appending the command with > output.html. If you would like to create print-friendly files instead of HTML files, simply change the style sheet that you are using. In the file name above, note "html/ldp.dsl" at the end. Change this to "print/docbook.dsl", or if you want XHTML output, instead of HTML, change the file name to "xhtml/docbook.dsl". Replace base.css with the name of the CSS file you would like to use. The docbook-utils provide commands like db2html, db2pdf and db2ps, based on the jw scripts, that is a front-end to Jade. These tools ease the everyday management of documentation and add comfortable features. The package, originally created by RedHat and available from http://sources.redhat.com/docbook-tools/ can be installed on most systems. After validating your document, simply issue the command db2html mydoc.xml to create (a) HTML file(s). You can also use the docbook-utils as validation tools. Remember: when errors occur, always start by solving only the first problem. The rest of the problems may be fixed when you fix the first error. If you get errors about a function name, please read . You can define your own additional DSL instructions, which can include a pointer to a personalized CSS file. Sample DSL and CSS files are provided in Appendix A. The sample DSL file will create a table of contents, and have all HTML files start with the prefix intro2linux- and end with a suffix of .html. The %stylesheet% variable points to the CSS file which should be called by your HTML file. You can compare the result here: http://tille.xalasys.com/training/unix/ is a book formatted with the standard tools; http://tille.xalasys.com/training/tldp/ is one using personalized DSL and CSS files. Soft tones and special effects, for instance in buttons, were used to achieve maximum effect. There are alternatives to DSSSL and Jade/OpenJade. When working with DocBook XML, the LDP offers a series of XSL style sheets to process documents into HTML. These style sheets create output files using the XML tool set that are similar to those produced by the SGML tools using ldp.dsl. The major difference between using ldp.dsl and the XSL style sheets is the way that the generation of multiple files is handled, such as the creation of a separate file for each chapter, section and appendix. With the SGML tools, such as jade or openjade, the tool itself was responsible for generating the separate files. Because of this, only a single file, ldp.dsl was necessary as a customization layer for the standard DocBook DSSSL style sheets. tldp-html.xsl - style sheet called to generate a single file. tldp-html-chunk.xsl - style sheet called to generate multiple files based on chapter, section and appendix elements. tldp-html-common.xsl - style sheet containing the actual XSLT transformations. It is called by the other two HTML style sheets and is never directly called. tldp-print.xsl - style sheet for generation of XSL Formatting Objects for print output. You can find the latest copy of the files at http://my.core.com/~dhorton/docbook/tldp-xsl/. The package includes installation instructions which are duplicated at http://my.core.com/~dhorton/docbook/tldp-xsl/doc/tldp-xsl-howto.html. The short version of the install instructions is as follows: Download and unzip the latest package from the web site. Take the files from the html directory of TLDP-XSL and put them in the html directory of Norman Walsh's stylesheets. Take the file from the TLDP-XSL fo directory and put it in the Norman Walsh fo directory. Note that you never directly call the style sheet tldp-html-common.xsl. It is called by both of the other two style sheets. If you want your HTML files to use a specific CSS stylesheet, you will need to edit tldp-html-common.xsl. Look for a line that ressembles <xsl:param name="html.stylesheet" select="'style.css'"/>. Replace style.css with the name of the CSS file you would like to use. The DocBook DTD defines the structure of a DocBook document. It contains rules about how the elements may be used; and what the elements ought to be describing. For example: it is the DocBook DTD which states all warnings are to warn the reader (this is the definition of the element); and may not contain plain text (this is the content model--and the bit which forces you to wrap your warning text in a para or perhaps a list). It is important that you download the version(s) that match your document. You may want to configure your system now to deal with "all" DocBook DTDs if you are going to be editing older LDP documents. If you are a new author, you only need the first one listed: XML DTD for DocBook version 4.2. The XML DTD is available from http://www.oasis-open.org/xml/4.2/. The LDP prefers this version of the DocBook DTD. Create a base directory to store everything such as /opt/local/sgml/. Copy the DTDs into a sub-directory named dtd. The DocBook standard is described in these files. If you change these files, you are no longer working with DocBook. If you qualify for a CVS account you may apply for one contacting CVS master Sergiusz mailto:[email protected] Include information about which documents you maintain. First you'll need to get an account at the LDP's CVS Repository. Please see the notes above on obtaining an account. This repository houses various documents including HOWTOs and Guides. Documents are sorted by the type of document (for example a HOWTO or a Guide), and by the markup language the document uses (for example DocBook or LinuxDoc). When your account is ready you can log in using one of the following commands. In all instances your_userid should be replaced by the user name you were issued in the response email. You will be prompted for a password after this first step. Wait patiently while the system tries to log you in. It can often take more that 10-20 seconds for the system to either accept (or reject) your password. Once you've used cvs login for the first time and have been given access to the system, your password is stored in .cvspass and you will not have to use cvs login again. Just set the CVSROOT with the export command listed above and continue on. If TLDP's CVS server is the only one you work with, you might also add an export CVSROOT line to your ~/.bashrc shell configuration file. checkout will add the full directory structure from tldp.org on down. Although it doesn't really matter where you put these files on your local file system you may not want to bury the directories too deeply. This CVS command will upload your changes to the CVS server. Please be sure to include a useful description of the changes that have been made to your document. cvs commit -m "A description of the work done on this version of the document." You must still email <[email protected]> when you are ready to have your changes appear on the live site. Your email should include the relative path to the file(s) in the LDP CVS tree that you wish to update. You can add new files to your CVS repository. These may be image files or additional XML files. First check that your HOWTO is in its own directory. You may want to coordinate with the people at <[email protected]> to ensure you can add graphics or other files to your HOWTO. After you've added the files, you still need to commit them to the repository (see above). If you need to change a file name, you still need to use the add command. First remove the copy of the file from your local disk. Then remove it from the CVS tree with: cvs remove filename. As with the add command, you need to >commit your removed file. Finally, now that the old file has been removed, add your new file using the instructions above (first add and then commit the additional file). There you are, typing away, when you screw up. Real bad. Doesn't matter what it is, but suffice it to say that you've toasted not only the version on your local drive, but created a new version on the CVS server. What you need to do is go back in time and resurrect an older version of your file. To do this, you'll need to know the version number of the file you want to retrieve. cvs diff will give a list of revisions if there are differences. You can pick the revision number, subtract one, and that is probably the revision you want to look at. will update the CVS server with the new (old) version of filename. An editor capable of inserting elements according to the DTD will help a lot since it will enforce the DTD. This way you can be sure that no invalid elements were added anywhere in your document. In order to ensure that future changes are as easy as possible, authors should try to keep compatibility with the XML version of the DocBook DTD. This means keeping element names in lower case, using double quotes in all attributes, and not omitting end tags. Most tools that automatically insert elements (like psgml+emacs) follow these rules automatically or with some fine tuning. Each type of document created has a specific structure. This document is in "book" format. Most authors, however, will want to use the shorter "article" format instead. Templates are available from Appendix A. Table D-1 shows some markup that is useful for generating generic documents. Remember that some elements are valid only on some contexts. Sometimes the appearance of a particular tag changes from one conversion format to another. As a beginner in DocBook writing, you may wish to see how your document looks in several formats before you publish them. You are advised to look at how your document is presented in HTML, PDF and PostScript, since these formats will be made available by TLDP once you publish your document. Since the formatting depends on the output style chosen, it's recommended to use as much markup as possible. Even if the appearance of the output doesn't seem to change with the standard output style, there may be specific output formats that will make these tags stand out. Index (NA) See Section D.4. <para>Please, see<xref linkend="secao" /> for more information. a. Text can be emphasized in a few ways. The most common ways are italics and bold. DocBook, however, supports only italics. The use of bold requires additional settings on the style sheet used. These notes were provided by: John Daily and Saqib Ali (<[email protected]>). <section> versus <sectN> is largely a question of flexibility. The stylesheets can make a <section> in a <section> look just like a <sect2> within a <sect1>, so there's no output advantage. But, a <section> within a <section> can be extracted into its own top-level section, nested even more deeply, or moved to an entirely different part of the document, without it and its own <section> children being renamed. That is not true of the numbered section tags, which are very sensitive to rearrangements. This can be easier for authors who are new to DocBook than using <sectN>. The main idea behind creating structured data is that it should be easy to access and query. One should be able to retrieve a subsection of any structured data, by using querying languages for XML (XPath and XQuery). <sectN> are useful when traversing a document using XPath/XQuery. <sectN> gives more flexibility, and control while writing an XPath expression. A well-defined, valid and well-structured document makes it easier for one to write XPath/Query to retreive "specific" data from a document. For example you can use XPath to retrieve information in the <sect3> block with certain attributes. However if you just used <section> for all subsections, it becomes harder to retrieve the block of information that you need. There are likely as many ways of doing this as there are DocBook authors; however, here are two ways that you might find useful. Thanks to Y Giridhar Appaji Nag and Martin Brown for the markup used here. For more information about entities, read Section D.8. If you would like to add the output of your commands you can add <computeroutput> text</computeroutput> within the <screen> or <programlisting> as appropriate. The generation of indexes depends on the markups inserted in the text. Such markups will be processed afterwards by an external tool and will generate the index. An example of such a tool is the collateindex.pl script (see Section B.6.2). Details about the process used to generate these indexes are shown in Section B.6.2. The indexes have nesting levels. The markup of an index is done by the code Example D-3. It is possible to refer to chapters, sections, and other parts of the document using the attribute zone. The generation of indexes depend on the inserted markups on the text. The Example D-4 has the code used to generate the entry of this edition on the index. In fact, since the attribute zone is used, the index statement could be located anywhere in the document or even in a separate file. However, to facilitate maintenance the entries for the index were all placed after the text to which it refers. It is necessary to insert pictures formats for all possible finished document types. For example: JPG files for web pages and EPS for PostScript and PDF files. If you use the TeX format you'll need the images as a PostScript file. For on-line publishing you can use any kind of common image file, such as JPG, GIF or PNG. The easiest way to insert pictures is to use the fileref attribute. Usually pictures are generated in JPG and in PostScript (PS or EPS). Replacing <figure> by <informalfigure> eliminates the need to insert a title for the picture. There's still the float attribute on which the value 0 indicates that the picture should be placed exactly where the tag appears. The value 1 allows the picture to be moved to a more convenient location (this location can be described on the style sheet, or it can be controlled by the application). When submitting graphics to the LDP, please submit one set of graphics in .eps, and another in .gif, .jpg or .png. The preferred format is .png or .jpg due to patent problems with .gif. You can use .jpg files for continuous-tone images such as photos or images with gradual changes in color. Use .png for simple images like diagrams, some screen shots, and images with a low number of colors. The first alternative to Example D-6 is to eliminate the <figure> or <informalfigure> elements. Another interesting alternative when you have decided to publish the text on media where pictures are not accepted, is the use of a wrapper, <imageobject>. Files using the following formats are available BMP, CGM-BINARY, CGM-CHAR, CGM-CLEAR, DITROFF, DVI, EPS, EQN, FAX, GIF, GIF87A, GIF89A, IGES, JPEG, JPG, LINESPECIFIC, PCX, PIC, PS, SGML, TBL, TEX, TIFF, WMF, WPG. This method presents an advantage: a better control of the application. The elements <imageobject> are consecutively tested until one of them is accepted. If the output format does not support images the <textobject> element will be used. However, the biggest advantage in usage of the format Example D-7 is that in DocBook 5.0, the <graphic> element will cease to exist. As a disadvantage, there is the need for more than one representation code of the same information. It is up to the author to decide how they will implement illustrations and pictures in the document, but for compatibility with future versions I recommend the use of this method for pictures and graphics. You may also want to try converting your image to an ASCII representation of the file. JavE (Java ASCII Versatile Editor) can do this conversion for you. It can be downloaded from http://www.jave.de/. It has an easy to use GUI interface. If you're more command-line oriented you may want to try: tgif (http://bourbon.usc.edu:8001/tgif/) and AA-Lib (http://aa-project.sourceforge.net/). Not everyone will choose to use the correct formatting for a bibliography. Most will use a list of some kind. And that's ok. But when you're ready to move to the next level, here's how to do it. Below are two examples of bibliographic entries. The first is a very simple entry. It has only a title, URL and possibly a short description (abstract). The second is a little more complex and is for a full entry (for instance a book) with an ISBN, publisher and copyright date. For a full list of all options, visit http://docbook.org/tdg/en/html/biblioentry.html. For more examples visit http://docbook.org/tdg/en/html/bibliography.html. By default <abstract>s do not display on web pages. You need to modify the biblio.xsl file. Do a search for the word "abstract" and then add this information inside the <xsl:template> tags. If that doesn't make sense, don't worry about it too much, but do be aware that it's required for the abstracts to show up. View References to see this in action. text macros for markup. An example would be a company URL. By using a parameter entity you could refer simply to &my-company-url; instead of typing out the full <ulink url="http://foo.bar">Foo.bar</ulink> each time. software license. Such as the GNU Free Documentation License: it is long. And must be included in full in each document. By leaving the license in a separate file you can easily include it in many documents without having to redo the markup each time. repeated text. For instance an introduction to a topic which is included both as a summary in one section and as an introduction to the full information in another. Saves on editing time if you need to make changes to both sets of text. To use these entities simply insert the name you gave the entity between a "&" (ampersand) and a ";" (semicolon). For example: "&shortcut;" would expand into "Replace 'shortcut' with this text"; "&sc-to-a-file;" would include the full contents of whatever is in anotherfile.xml. An important feature while writing a text is the ability to check whether or not it will be presented in the final draft. It is common to have several parts of the text marked as draft, especially when updating an already existing document. With the use of parameter entities, you can include or eliminate these drafts by altering only one line at the beginning of a document. The entity review might have several texts defined, as in Example D-13. When the changes to the text are considered final, you need only to remove parts of the text between the 3rd. and 6th. lines. To keep the draft definitions and hide the text in the final draft, just alter the specification of the entity from INCLUDE to IGNORE. A variety of free and commercial tools exist for doing "up conversion" of non-XML formats to DocBook. A few are listed here for your convenience. A more comprehensive list is available from Convert Other Formats to DocBook. The txt2docbook tool allows one to convert a ascii (README-like) file to a valid docbook xml document. It simplifies the publishing of rather small papers significantly. The input format was inspired by the APT-Convert tool from http://www.xmlmind.com/aptconvert.html. The script can be downloaded from http://txt2docbook.sourceforge.net/. Siep Kroonenberg reports that there is a package tex4ht http://www.cse.ohio-state.edu/~gurari/TeX4ht/ that converts TeX and LaTeX to various flavors of XML. Currently, its support for DocBook output is limited. If you want to use tex4ht in its current state for LDP you will probably have to hack your LaTeX source beforehand and the generated XML afterwords. This section is contributed by Chris Karakas. You can use the LyX-to-X package to write your document conveniently in LyX (a visual editor originally developped as a graphical frontend to LaTeX), then export it to DocBook SGML and submit it to The LDP. This method is presented by Chris Karakas Document processing with LyX and SGML. In the LyX-to-X project, LyX is used as a comfortable graphical SGML editor. Once the document is exported to SGML from LyX, it undergoes a series of transformations through sed and awk scripts that correct the SGML code, computes the Index, inserts the Bibliography and the Appendix and takes care of the correct invocation of openjade, pdftex, pdfjadetex and all the other necessary programs for the generation of HTML (chunked or not), PDF (with images, bookmarks, thumbnails and hyperlinks), PS, RTF and TXT versions. All aspects of document processing are handled, including automatic Index generation, display of Mathematics in TeX quality both online and in print formats, as well as the use of bibliographic databases with RefDB. Special care is taken so that the document processing is as transparent to the user as possible - the aim being that the user writes in LyX, then presses a button, and the LyX-to-X script does the rest. Download the documentation and the LyX-to-X package from the Formats section. There are a few changes between DocBook XML and SGML. Handling these differences should be relatively easy for most small documents, and many authors will not need to make any changes to convert their documents other than the XML and DocBook declarations at the start of their document. For others, here is a list of what you should keep in mind when converting your documents from SGML to XML. An XML element typically has three parts: the start tag, the content (your words) and the end tag. Qualifiers are added in the start tag and are known as attributes. They will always have a name and a quoted value. The start tag contains one attribute (class) with a value of "directory". The end tag (also filename) must not contain any attributes. All attributes in the start tag must be "quoted". This can be either single (') or double (") quotes, but not reverse (`) or "smart quotes". The quote used to start a name="value" pair must be the same quote used at the end of the value. In other words: "this" would validate, but 'that" would not. If you're converting from SGML to XML, be sure file names refer to .xml files instead of .sgml. Some tools may get confused if a .sgml file contains XML. Tag minimizations were used in SGML instead of writing out the element name in the end tag. Example: <para>This is foo.</> Tag minimizations are not supported in XML and their use is discouraged in DocBook. The significant changes between version changes in the DTD involve changes to the elements (tags). Elements may be: deprecated (which means they will be removed in future versions); removed; modified; or added. Almost all authors will run into a changed or deprecated tag when going from a lower version of DocBook to a higher version. All tags that have been deprecated or changed for 4.x are listed in DocBook: The definitive guide, published by O'Reilly and Associates. This book is also available on-line from http://www.docbook.org. artheader. has been changed to articleinfo. Most other header elements have been renamed to info. graphic. has been deprecated and will be removed as of DocBook 5.x. To prepare for this, start using mediaobject. There is more information about mediaobject in Section D.5. imagedata. file formats must now be written in UPPERCASE letters. If you use lowercase or mixed-case spellings for your file formats, it will fail. An attribute makes available extra information regarding the element on which it appears. The attributes always appear as a name-value pair on the initialization pointers (i.e. the "start tag"). Example of an attribute is id="identification", which gives the attribute id the value identification. Set of overlay rules that are read by your HTML browser, which uses these rules for doing the display, layout and formatting of the XML-generated HTML file(s). CSS allows for fast changes in look and feel without having to plunge in the HTML file(s). Helper file for the display and transformation tools, which maps public identifiers and URLs to the local file system. A common document management system used by the LDP. An SGML (and XML) application, describing a document format that allows easy management of documentation. Software package easing XML conversions. A group of statements that define element names and their attributes specifying the rules for combinations and sequences. It's the DTD that defines which elements can or cannot be inserted in the given context. DSSSL stands for Document Style Semantics and Specification Language. It's an ISO standard (ISO/IEC 10179:1996). The DSSSL standard is internationally used as a language for documents style sheets pages for SGML. The elements describe the content's structure in a document. Most elements contain a start tag, content and a closing tag. For example a paragraph element includes all of the following <para>This is the paragraph.</para>. Some elements are "empty" and do not contain content and a closing tag. An example of this is a link to an external document where the URL is printed to the page. This element would include only the following <ulink url="http://google.com/>. Popular text editor, especially on UNIX systems or alikes. An entity is a name designated for some part of data so that it can be referenced by a name. The data could be anything from from simple characters to chapters to sets of statements in a DTD. Entity parameters can be generic, external, internal or SGML data. An entity is similar to a variable in a programming language, or a macro. An external entity points to an external document. External entities are used to include texts on certain locations of a SGML document. It could be used to include sample screens, legal notes, and chapters for example. Objects such as side bars, pictures, tables, and charts are called floats when they don't have a fixed placement on the text. For printed text, a chart can appear either at the top or at the bottom of the page. It can also be placed on the next page if it is too large. LDP hosts a number of documents that are a list in the form of questions and answers. These documents are called FAQs. A FAQ is usually a single-page document. An entity referenced by a name, which starts with "&" and ends with semicolon is a generic entity. Most of the time this type of entity is used in the document and not on the DTD. There are two types of entities: external and internal. They can refer to special characters or to text objects such as repeated sentences, names or chapters. Like the GNU Public License for free software, but with specifics for written text and documentation with software. License type for software that guarantees that the software remains freely distributable, that the source code is available, that you can make changes to it and redistribute those changes if you want, on the condition that you keep on using the same license for your derived works. TLDP documents that are too long to be a HOWTO are usually stored as guides. These are more like entire books that treat a particular subject in-dept. Documents that discuss how to do something with a system or application. Most documents hosted at TLDP are HOWTOs, explaining how to install, configure or manage tens of applications on a variety of systems. HOWTOs are typically 10-25 pages. An internal entity refers to part of the text and is often used as a shortcut for frequently repeated text. An application which applies the rules defined in a DSSSL style sheet to an SGML or XML document, transforming the document into the desired output. Code added to the content of a document, describing its structure. Text in your document that is not important for understanding the subject, but that should be there anyway, such as version information, co-authors, credits to people etc. 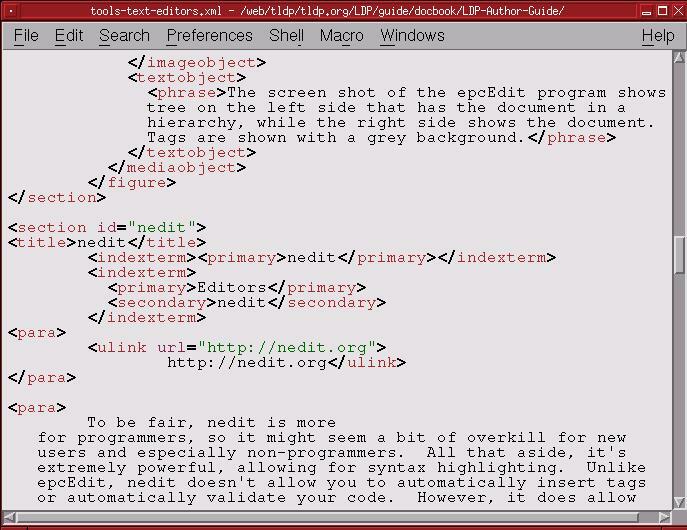 Text editor oriented to programmers. SGML document parser and validator program. Open Source office suite, compatible with Microsoft Office. An entity type often used in the DTD or a document's internal subset. The entity's name starts with a percent sign (%) and ends with a semicolon. Emacs major mode that customizes Emacs for editing SGML documents. OASIS is a non-profit, global consortium that drives the development, convergence and adoption of e-business standards. Draft of your document that conceptualizes the subject and scope. Summary and To-Do list for the work to come. Standard document type supported on a wide range of operating systems. Document format designed for printable documents. PS is the standard print format on UNIX(-alikes). TLDP doesn't accept just anything. Once you submit a document, it will be checked for consistency, grammar, spelling and style by a reviewer, a volunteer assigned by the review coordinator. Standard Generalized Markup Language. It is an international standard (ISO8879) that specifies rules for the creation of electronic documents in markup systems, regardless of the platform used. Obviously, the subject is what your documentation is about. The scope defines which areas of the subject you are going to discuss, and how much detail will be involved. An SGML element bounded by the marks "<" and ">". Tags are used to mark the semantic or logical structure of a document. A sample is the tag <title> to mark the beginning of a title. Popular UNIX text formatting and typesetting tool. The process of converting a document from its original DocBook XML form to another format, such as PDF, HTML or PostScript. The process of checking your XML code to ensure it complies with the XML DTD you declared at the top of your document. Popular text editor on UNIX and alike systems. Popular word processor, runs on many systems. eXtensible Markup Language. A sub-product of SGML created specifically for Internet use. Command line XML parser and validator. Free but not Open XML editor. Command line XML transformation program. XML Style Language. XSL is to a XML document what a DSSSL style is for a SGML document. The XSL is written in XML. Framework for managing documents, consisting of the XSLT transformation language, the XPath expression language and XSL formatting objects. You may extract a single document from such a collection, and dispbibute it individually under this License, provided you insert a copy of this License into the extracted document, and follow this License in all other respects regarding verbatim copying of that document. Please, take a look at the source to see how to get similar results on your documents. You should also remember that the way this appears to you depends on the format in which you are reading this document: online appearance is slightly different from the PostScript or PDF ones. In truth, "XSL" is actually comprised of three components: the XSLT transformation language, the XPath expression language (used by XSLT), and XSL Formatting Objects (FO) that are used for describing a page. The style sheets are actually written in XSLT and generate either HTML or (for print output) FO. The FO file is then run through a FO processor to create the actual print (PDF or PostScript) output. See the W3C web site for more information. In XSL terminology, the process of generating multiple files is referred to as "chunking".